Having drafted the essay on the detrimental effects of cell phone use in college, and having been graded on that draft, you will do three things with the paper in the next stage of the development process, which I call the Errors Analysis project. 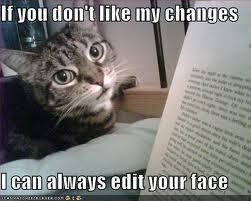 1) You will edit and revise your paper to make it perfect. 2) You will write an analysis, in your own words--not quoted verbatim, of each of the editing errors that were marked on your paper. 3) You will turn in the revision along with your errors analysis document for my (re)evaluation. So you will turn in hard copy of three things: the graded papers which I have already marked, the corrected and revised copy of the essay, and the errors analysis document. The three documents should look like this sample. 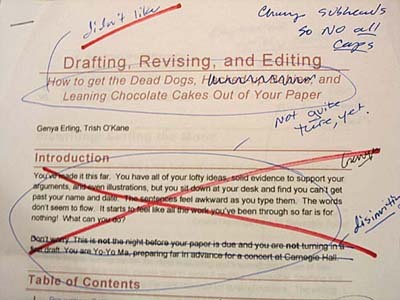 First, you will need the evaluated copy of your essay, with the grading marks and my comments. Refer to the Little Seagull Handbook to discern the nature of the error (e.g., P-7, S-5a, P-1b, etc.). Correct the first error on your graded paper and number it 1, using any color of ink except black, and circle that number. Number the correction on the marked paper by hand so that it corresponds with the number on your errors analysis document. When you make the correction on the final draft, do not type the numbers on the corrected copy; pen them in. See the sample. 6b. Do not simply describe what change you have made; I’ll be able to see that in the final draft. For example, "I forgot to put in a comma," doesn’t show that you know why the comma was needed. "Commas should separate a series of modifiers," shows that you understand that convention for use of commas, which is handbook rule P-1c. The errors analysis can be tedious and repetitive, but that is good. Repetition reinforces understanding, and you don’t want me to have to keep marking the same editing errors in the rest of your work this semester because you will not like your grades if I don't see improvements. 6c. If it’s not clear to me that you understand what the errors are, how to fix them and, therefore, how to avoid them hereafter, you won’t recieve credit for the errors analysis assignment. Pretty tough, huh? The errors analysis is an important way to learn how to avoid repeating the same errors in subsequent papers, so be conscientious and do it well.